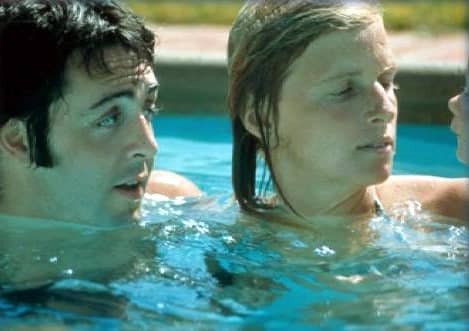 Linda McCartney was a photographer, musician and animal rights activist. She met Paul McCartney in London in 1967; they married in 1969, remaining together until her death in 1998. She was born Linda Louise Eastman on 24 September 1941 in New York City. She had one brother and two sisters, and was raised in the wealthy Scarsdale area of Westchester County, New York. Her father, Lee Eastman, a showbusiness laywer, had changed his name from Leopold Vail Epstein. He was the attorney of songwriter Jack Lawrence. Her mother Louise Sara Lindner Eastman, the heiress to the Lindner department store fortune, died in an air accident in 1962. I remember when I first met John Eastman, I asked him, 'What do you want to do? What's your ambition in life?' He said, 'To be the president of the United States of America,' which fairly soon after that he didn't want to do. They were very preppy. Very aspirational. Linda Eastman studied fine art and history at the University of Arizona. She married John Melvin See Jr in June 1962; their daughter Heather Louise was born on 31 December that year. The couple divorced in June 1965 – she later described See as a "nice man, a geologist, an Ernest Hemingway type". Two months later, Eastman saw The Beatles perform at their historic first Shea Stadium show on 15 August 1965. As she was a real music fan she was quite pissed off with everyone screaming. I think she enjoyed the experience but she genuinely wanted to hear the show. That wasn't the deal, though. Not then. She was introduced to photography by Hazel Archer, a teacher in Arizona, who gave her some simple advice: "Borrow a camera, get a roll of film and take pictures." Her first published pictures appeared in Spotlight, the UK actors' directory, after she was invited to accompany a journalist friend to a Shakespeare season by the Royal Academy of Dramatic Art. In 1965 she returned to New York, working for a time as a receptionist at Town And Country magazine. It was here that she chanced upon an invitation to join The Rolling Stones' press launch for Aftermath, due to take place on a yacht on New York's Hudson River on 24 June 1966. Linda managed to talk her way onto the boat, becoming the only photographer present. The resulting images were in high demand, and appeared in a number of publications. She left Town And Country to become a professional photographer, often taking pictures of musicians onstage and off-duty, often in Central Park and in New York venues such as Fillmore East. She took images of artists including Aretha Franklin, Jimi Hendrix, Bob Dylan, Janis Joplin, Eric Clapton, The Who and The Doors. Her portrait of Eric Clapton taken on the front cover of the 11 May 1968 issue of Rolling Stone magazine was the first by a woman. her photographs have been displayed in more than 50 exhibitions worldwide, including the Victoria and Albert Museum in London. In 1992 a book, Sixties: Portrait Of An Era, was published. Photography made me a different person because it was something I loved doing and just nothing else mattered. I could just take my camera and go, probably like Diane Arbus felt when she was taking pictures. I had that feeling. Even thought I had a child I still felt single. It's different when you're married and you've got to go cook dinner. I could just go, go anywhere. 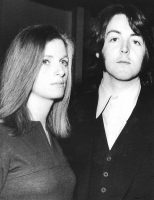 Linda Eastman met Paul McCartney at the Bag O'Nails club in London on 15 May 1967. So she was sitting in an alcove near the band, which was Georgie Fame and the Blue Flames – with Speedy Acquaye on bongos. They were always a big favourite of mine. I saw her and thought, 'Hello...' When she was about to leave the club, I stood up and said, 'Hello, we haven't met' – which was a straight pull. Then I said, 'We're going on to this next club called the Speakeasy. Do you want to come?' And if she'd said 'no' I wouldn't have ended up marrying her. She said, 'Yeah, all right.' So we went on to the Speakeasy, and it was the first time any of us had ever heard A Whiter Shade Of Pale. We all thought it was Stevie Winwood. It turned out to be the group with a very strange name – Procol Harum. That was the first time we ever met – and then we met on and off, because I would see her if I went to New York or if she was in London. They met again four days later at Brian Epstein's house in Belgravia, London, at the launch party for Sgt Pepper's Lonely Hearts Club Band. After her photographic assignments were complete she flew back to the US. Their paths crossed once more in New York in May 1968, following The Beatles' return from India. McCartney and John Lennon were in the city to announce the formation of Apple Corps, carrying out a succession of interviews for the press and an appearance on NBC-TV's The Tonight Show. In May, John and I went to New York to announce that Apple was starting: 'Send us your huddled talent.' We wanted a grand launch, but I had a strange feeling and I was very nervous. I had a real personal paranoia. I don't know if it was what I was smoking at the time, but it was very strange for me. I remember sitting up there and being interviewed. John was wearing a bus driver's or a prefect's badge, and he was doing well. Linda was there taking photos, and afterwards I said, 'Couldn't you tell I was nervous?' but she said it was fine. Wonderful wonderful woman. Such a shame they didn’t catch the cancer in time. She and Paul would’ve been together forever. She has become a rather saintly figure since her death, in contrast to all the negative reactions she attracted when she replaced the popular Jane Asher and when she was playing and singing with Wings. Linda won a Grammy award in 1974 with Paul and Denny Laine for Band on the run as best vocal group. She had the last laugh on the naysayers! People who didn’t know Linda mistook her shyness as being aloof. I wish I’d known her personally. We were born the same year. How proud she would of the way her brew turned out. My my, Mary is a fine photographer. Paul kept the family close. I love the McCartneys! Linda was a lovely housewife she and Paul who raised their four kids although I met only son James in person here in Seattle up in Fremont at the High Dive Bar for his big gig it was back in May 19th at 8pm as I do recall he was only one himself since he didn’t have any fellow musicians at the time while James was in town. It was fun I enjoy it. I m an Beatles fan today too. To get up on the stage with little musical talent and to give countless promotional interviews I doubt that Linda was that shy. While I don’t agree that she, or anyone for that matter, should be villified Linda wasn’t beyond criticism either. Since her death, she and her marriage have been idealised beyond belief. Many women in music, then and now, worked hard at their careers in the predominantly male world of rock music, and often awarded much less recognition compared to their male peers. Yet Linda was catapulted right up there for being married to a Beatle and recruited to his band. If Paul had married a fellow musician I could understand if he wanted to take a different direction, but I found Linda audacious in thinking that it just wouldn’t matter to the legions of Beatles’ fans at the time. As for their personal relationship, if they were so enamoured of each other they should have waltzed off together into the sunset after meeting at the Bag O’Nails. Their subsequent sneaky hookups would have saved a lot of grief all round.